Charles Taylor, Professor Emeritus at McGill University, has recently been awarded a prestigious new prize established for thinkers whose ideas are of broad significance for shaping human self-understanding and the advancement of humanity. In honour of the occasion Craig Calhoun offers a guide to engaging with Taylor’s work, which deals with topics ranging from personal identity to the challenges of modern democracy to religion in a secular age. 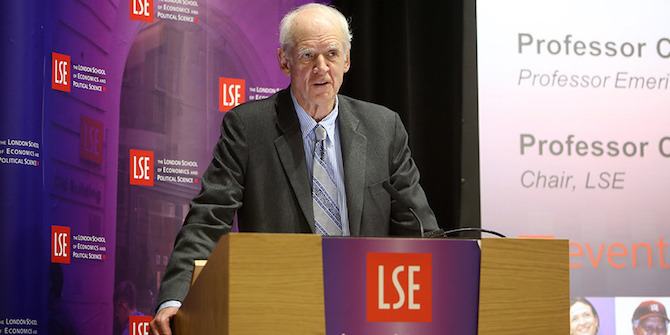 Professor Charles Taylor visited LSE last year and spoke to Sonali Campion about how his thinking had be influenced by his time spent in India. Read the full interview here. One of the world’s most respected philosophers has just won the $1 million Berggruen Prize. Is this news you can use? Yes, as a matter of fact, it is. The prize has been given to Charles Taylor, an exceptional thinker whose work can be of value both personally and in public life. In his native Canada, Taylor was a founder of the New Democratic Party, shaped debates and policy on immigration and ethnic politics, and played an important role in keeping Quebec part of Canada but with special status recognising its distinctive culture. Taylor is of global influence as a Catholic thinker, a leader on the social democratic left and a spokesperson for combining rather than opposing liberalism and defense of community. His publications will reward readers with very different interests from personal identity to the challenges of modern democracy to religion in a secular age. This guide is far from comprehensive. It points to some good places to start engaging with one of our era’s greatest thinkers. Perhaps most notably, in connection to the Berggruen Prize, Taylor has helped reshape debates on what it is to be human and how culture and politics matter in human existence. A lot of criticisms are leveled at modern Western individualism. Taylor acknowledges that it can seem narrow, shallow and too focused on instrumental self-interest. Still, he refuses simple negativity. The modern idea of self brought new richness and freedoms to human life. It not only built on foundations like St. Augustine’s articulation of a sense of interior space and the importance of memory. It also added distinctive dimensions that opened it to embrace equality in ways ancient thought had not. That we struggle for meaning and purpose in our lives is an indication of the potential opened for us. Taylor’s “Sources of the Self” traces the development of this modern understanding of what it means to be a person and explores its positive contributions and possibilities as well as its limits and potential weaknesses. The story proceeds in several phases. The era of the Protestant Reformation (and the Catholic response, which was never simply resistance) played an important role. So did Enlightenment celebration of reason, applied to self-knowledge and linked to the idea of self-mastery. But Taylor places a special emphasis on Jean-Jacques Rousseau and the Romantics. These built on earlier traditions like romantic love and integrated emotions and aesthetics into their accounts of the human self and embraced nature in newly positive ways. Rousseau helped make living in accord with nature into an ideal (in place of mastering nature and escaping from “baser” instincts or fallen character). Johann Gottfried Herder argued that human nature is not a determining force but a range of possibilities and capacities demanding expression. So basic is the notion of self-expression that moderns can hardly think of the self without it. This transformed the Christian idea of vocation or calling and underpinned a new idea of equality based on recognition of difference. Language was a crucial medium for this expression, along with art, religion, action and ethical relationships. Humanity expressed itself differently in different cultures and even person by person. This diversity was not determined by a fixed human nature; it was made available by the natural capacities of human beings. Working out its implications is a basic task for human beings, both at the level of cultural differences and in individual life. So is reconciling what might be called the Enlightenment and Romantic sides of the modern self: the pursuit of both self-knowledge and self-mastery and distinctive self-expression and authenticity. “Sources” is an intellectual history, but with broader intent. All of Taylor’s major books embed arguments in histories because he wants to show human beings as a process of becoming, not simply determined by nature. We face new circumstances and also face recurrent dilemmas, enriched by a growing range of intellectual and moral resources. Through tracing how modern thinking about the self developed, Taylor demonstrates both how powerfully ideas can shape our lives and that there are always multiple possibilities for how they can be put to use. For example, individualism and a focus on the self became associated with secularism. But it was advanced by 17th century religious thinkers as part of a more personal relationship with God, manifested in individual prayer and supported by autonomous interpretation of the Bible. Religious devotion both influenced the development of the modern self and was transformed by it. Likewise, individualism is often linked with greed and self-interest. Homo economicus is a modern conception. Relatedly, a prominent line of development in the modern self cast it as “punctual” as though each of us is a finite and bounded unit and like the points of geometry, a member of various sets like nations or humanity as a whole. Taylor doesn’t deny this but shows that among the sources of the modern self was also a moral revolution in which “ordinary happiness” in this material world was given a positive value not simply opposed to otherworldly spiritualism. This was linked to recognising lay professions as comparably important to the priesthood, valuing the family more and with it, recognising and extending childhood as a stage of human development. Neither families nor professions are simply sets of altogether discrete individuals. So we have also resources for recovering more relational, socially embedded understandings of the self. As part of telling this story, Taylor offers important lessons on how ideas change, emphasising how seldom they simply move from right to wrong but rather tend to resolve certain weaknesses, as well as introduce other potential issues. This can result in overall movement from worse to better, but there are always different possible paths as the meaning of ideas evolves and escapes their originators’ intentions. We face choices. We can limit individualism to notions of self-interest and necessity, but we don’t have to. After all, it also shaped development of the notion of human rights. How we judge this or other ideas will reflect our “horizons of evaluation” including both what we think is possible and what we think is good. Our strongest commitments put other preferences into perspective. The theme of what it means to be a person, a human being, runs through Taylor’s life’s work. It is enormously important in an era of great transformations. Definitions of the human and the self are challenged today by technological innovations from artificial intelligence to gene editing. They are also important to figuring out what ethics and policies should guide those new technologies. And not least, we live in a world where projects of personal identity are as influential as economic self-interest or old ideologies in shaping politics. This is true in “progressive” forms like the transformation of gender and sexual identities and claims to equal rights. And it is true in “conservative” forms like the claims to national and communal identities defended today by populist movements. This makes questions of identity personally significant and refusals of acceptance and respect deeply challenging. This extends to identities that can also be politically mobilized like nationality, race, ethnicity, gender or sexuality. The politics of identity and recognition are reinforced by another central theme in modern culture: a value of “authenticity.” A strong horizon of evaluation for many moderns is to be “true to themselves.” This is linked to imaging ― we each have an inner essence, recasting the older idea of individual soul. People often think of this as their “nature,” and it can be problematic when it encourages people to regard relationships as disposable or to imagine that being true to themselves demands being inflexible. But for Taylor, these are debased versions of an idea with much positive ethical potential. Our deepest selves are constituted by our strongest values and commitments and are shaped by the most significant relationships of our lives. We can approach authenticity as an orienting ideal, aware both that we don’t always fully understand our own deepest commitments and that we often fail to live up to them. Moreover, recognizing that everyone has their own way of being human facilitates respect for individuals, but also for different cultures. The effort to be an authentic person gives modern people a propensity to be “seekers.” The idea of trying to “find yourself” wouldn’t have made as much sense in many other eras. It is closely related to freedom from restrictions and the material availability of options, for example in the choice of occupations, politics or social movements. Taylor uses the term “seekers” to describe the large number of people who describe themselves as religious or spiritual but not committed to any one organised religion. This suggests something of an ambivalence with which he thinks moderns live, which can be troubling but is also ethically liberating and often creative. We often seek identification with existing communities and cultures, but we also, to an unprecedented degree, think of ourselves as choosing among them. And we change them. What happened to the “politics of identity” reflects this. Early usage often suggested that identities were malleable, and there was fluidity in how they were to be valued, inhabited, combined. But often, the politics of identity became a more rigid demand for respect for supposedly fixed and essential identities. Quebec is never far from Taylor’s mind when he thinks of the politics of identity and recognition. He grew up with a Francophone mother and an Anglophone father. From early in life, he was committed to a multicultural vision for the province and for Canada, convinced that instead of being “two solitudes,” Canada’s major linguistic and cultural communities could enrich each other. When he was named to Oxford’s prestigious Chichele professorship in 1975, he decided he would only stay five years, at least partly because he wanted to return to Montreal and make sure his daughters had the chance to grow up bilingual. He helped to articulate the rationale for Quebec’s special status in Canada. But he also campaigned to keep Quebec part of Canada, arguing that with proper care and mutual respect, pluralist societies could be richer and stronger than those seeking an integriste conformity. Taylor extends this point more generally. To be true to yourself need not mean either standing apart or trying to share a singular identity only with others just like you. It can and usually should mean recognizing diverse interests and commitments in yourself, being open to a sense of possibility and guided by strong (though corrigible) convictions. One of Taylor’s most important points is that we don’t just “have” selves ― we have the potential and usually the desire to be better selves. Like almost every other path of engagement with Taylor’s work, the politics of recognition and the ethics of authenticity bring us back to what it means to be human. Language is core to that. Taylor isn’t interesting simply in distinguishing humans from other animals by the capacity for language (and of course we know, as 17th and 18th century thinkers didn’t, the extent to which other animals are capable of language). Taylor’s concerns, rather, are the extent to which language makes us who we are, the fact that we have language only by sharing it and that we use language expressively, not just instrumentally. Language, for Taylor, is constitutive of human being; we are language animals. Taylor expands on the famous Sapir–Whorf hypothesis, showing how basic language and culture are to the ways in which we know other human beings and indeed the material world. This is one reason why cross-cultural understanding requires mutual learning, not just translation. It is also among the reasons why interpretation is basic to the human sciences. Important currents in behavioral and social science have been driven by a desire to achieve “objectivity” by disengaging from interpretation. Of course, knowledge of humans includes many “objective” elements from physiology to demography. But it cannot be complete ― or wise ― on these bases alone. Humans are not altogether objective and transparent even to themselves. Take voting. One may objectively observe people raising hands or shouting “aye” and “nay” in a meeting, but one can’t make sense of this as voting without knowing more about a linguistically constituted practice and the background of a culture in which it is pervasive. Within that culture, researchers can take the background for granted, but the need for interpretation becomes evident as soon as they step outside that basis for consensus interpretations. Cultures vary and no analyst’s knowledge escapes culture. Like other human practices, moreover, voting often expresses meanings that go beyond manifest, instrumental decisions. Language enables us to reflect and plan and engage in agency, not only reactive behavior. This was a key point in Taylor’s first major work, where he showed why deterministic explanations of behavior (like B.F. Skinner’s behaviorism) must be inadequate to human action. Speaking is an example. It draws on a background resource ― language ― available to us only because we are not completely discrete individuals. But speaking is an action or more precisely, a practice. Taylor illustrates this point by building on Wittgenstein’s famous account of following a rule. To follow a rule depends not just on knowing the rule itself in some objective sense (as a matter of premises and propositions, to use the technical philosophical terms). It depends also on a tacit background of knowledge that is never rendered entirely explicit. To use Wittgenstein’s term, rules and the capacity to follow them are embedded in “forms of life” ― or, loosely, cultures. But here it is crucial to understand cultures as something more than themselves catalogs of rules or formal structures. Starting with language, they are webs of meaning that people do not merely decode but inhabit and enact. One does not speak French merely by mastering the rules of French grammar (and of course, few Frenchmen can state those rules in much detail). To speak French is a practice, and competency is achieved by habituation, internalisation, making it part of oneself. Likewise, to follow a rule is a practice that both depends on culture and expresses it ― whether it is as seemingly simple as traffic rules or as complex as the injunction to treat other human beings as ends rather than means. This argument is pitched against narrow Cartesianism, with its starting point of a solipsistic “I think therefore I am,” and the whole related project of epistemology as a matter of abstract reason. Taylor elaborates it now partly because advances in computational technology have encouraged the spread of new mechanistic, entirely instrumental explanations of human thought and action. These reflect what Taylor (following Heidegger) calls an “enframing” approach – treating language simply as a tool for communication and as external to the reality it names or describes. Such views encourage reductionism toward human beings as well as language. An enframing perspective neglects not only the constitutive role of language but also the power of imagination in shaping human life. This enables us to reach beyond what is immediately evident to our senses. We are able, for example, to form and act on aspirations for the future. Imagination, like language, also gives shape to the world. Much of “reality” exists in the way it does partly because of how it is imagined. This is not just a free-for-all of individual creativity; wishing does not make things so. But there are socially organized ways of imagining the world. Taylor describes several such “imaginaries” that help produce and reproduce the modern world: the idea of a generalized market is one of the most powerful. So is the idea of “the people” critical to democracy and also to legitimacy in other political systems. Business corporations and nations exist partially through the ways they are imagined. Imagining modernity as a secular age is equally fundamental. This commonly involves what Taylor terms a “subtraction story.” Religion used to be a bigger part of human life and culture, but in the modern era, there has been progressive disenchantment; fewer people declare themselves believers; religion loses most of its public role; science replaces religion as the basis for authoritative knowledge. Taylor acknowledges these changes, but insists they can’t be well understood simply as subtractions that don’t entail transformation of culture more generally. Religion’s role changes as people reimagine what the world, human life and knowledge are like. How moderns understand personhood, moral obligations or the place of material well-being in a good life are all changed; religion is not simply subtracted from them. One of the most dramatic changes is the rise of what Taylor calls “the immanent frame.” This is the notion that everything in the world is part of a natural order understandable without reference to anything outside itself and simply as a matter of causal relationships. This isn’t simply a truth modern people discovered; neither is it false. It is part of a secular social imaginary. It is one way of understanding and giving form to the world and human life. Within the immanent frame, ideas about transcendence are either errors or simply unnecessary to achieving empirically verifiable knowledge. This understanding of the world has proved enormously productive in the rise of modern science. It has been limiting in spiritual life. It has also shaped an approach to the environment as simply a matter of cost, effect, resources and use ― at odds with a notion of more transcendent value. Indeed, within this immanent frame, values themselves tend to be understood simply as more or less arbitrary subjective states of individuals. Nature doesn’t have a value ― we either value it, or we don’t. Similarly, we may value human life more or less, but as a matter of cause-and-effect relationships, human beings don’t have intrinsic value. We see quickly that the immanent frame thus shaped not only the successes of modern science but also some of its dangerous moments. These may have been deviations from a more moral scientific ethos that includes ideas like not doing harm but these moral ideas generally come from outside the immanent frame. Today, the immanent frame is also challenged by the notion that human beings are radically transforming what seemed to be an entirely natural order ― whether through climate change or gene editing. Once again, Taylor narrates an intellectual history in which there are gains, losses and possibilities for recovering what at some points appeared as paths closed off. A secular perspective grew first among religious people, for most of whom it was part of a deepening and more explicit religious faith ― notably in the 16th and 17th centuries. As modern science and states offered more control over matters in the material world, religion was called on as a guide. But in time, more and more thinkers distinguished questions of value on which religion could offer guidance from questions of fact and explanation. Many had a sense that to face the great transformations of a new era, religious innovation was required. Those who made the innovations didn’t imagine that for others, they would become part of a path away from religion ― any more than creators of modern technologies imagined that living in a world that felt technologically overpowered would lead many to seek a renewed spirituality. Religion, thus, isn’t simply a matter of holding different abstract intellectual commitments from others, believing in the factuality of different propositions. It is participating in a different way of imagining the world. This can include achievements of modernity and the cause-and-effect systems in which they are embedded but isn’t limited to that. Reaching beyond might be based on belief in a higher power like God. It might also be based on commitment to a good higher-than-mere-instrumental human flourishing, like love (especially in the sense ofagape). We have moved “from a society where belief in God is unchallenged and indeed, unproblematic, to one in which it is understood to be one option among others and frequently not the easiest to embrace.” But even if religion becomes in some sense harder, it doesn’t vanish and religious experience may even gain new dimensions. Taylor’s monumental “A Secular Age” is perhaps the single most influential work ever published on the phenomena of secularity (as well as the ideology of secularism). Ranging from the poetic to the social scientific to the deeply philosophical, it mobilized Taylor’s astonishing historical learning to advance understanding of what it means to live in a modern world. It has rightly transformed discussions in fields from sociology to history, anthropology and religious studies. Charles Taylor’s approach to philosophy is always shaped by deep ethical commitments and public concerns. He addresses technical intellectual problems, but he is never interested in them only as technical problems. He writes accessibly. He travels widely, not simply to speak to audiences about arguments he regards as conclusively settled but to engage in discussions that are always potential occasions for intellectual advancement ― and he listens patiently to the most naïve questions, treating each as though it might contain an important new idea. Taylor’s approach also brings philosophy into the full range of human sciences and brings the more empirical humanities and social science into philosophy. It must be so, he seems to suggest, if the study of philosophy is truly to pursue wisdom. The founders of the Berggruen Prize describe it as “awarded annually to a thinker whose ideas are of broad significance for shaping human self-understanding and advancement.” It’s hard to imagine a more appropriate first recipient than Charles Taylor. This post first appeared on the Huffington Post/World post and is reposted with the author’s permission. Craig Calhoun is former President and Director of the London School of Economics and Political Science. He is now President of the Berggruen Institute.